We invite you to join us on Thursday, March 10th for a one-day in-depth learning experience. Organic Intensives are an opportunity to acquire practical, detailed information from experts and practitioners over the course of a day with fellow Michigan farmers and gardeners. For 2016 we have invited individ­uals who are recognized experts and educators in one of three topic areas: Wild Edibles and Herbs as Part of the Good Food Solution, Field Crops: Transition to Organic, and Saving and Producing Organic Seed. Lisa Rose is an herbalist, forager, urban farmer, and published author. Rose’s professional career has included food work in the Napa Valley, Leelanau County, and Grand Rapids. Beyond the Great Lakes, Rose’s interest in ethnobotany and herbal medicine have taken her across the United States and into the Yucatan, mainland Mexico, Nicaragua, and Brazil to study plants, people, health, and their connection to place. 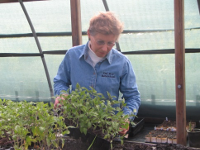 Rose has been part of growing the local food movement in West Michigan from the ground up. She is the author of Grand Rapids Food (History Press, 2013), Midwest Foraging (Timber Press, 2015) and is currently writing Midwest Medicinal Plants (2017). When she is not in her own gardens or kitchen, Rose can be found in the fields and forests, leading foraging plant walks and teaching classes on edible and medicinal wild plants. She lives in Ada with her two children and golden retriever, Rosie. Follow Rose on her wild botanical journeys on her website, burdockandrose.com. For more information and a schedule for the day, see the one-page flyer. • Details on marketing your organic crops from several experienced farmers. • The key parts of organic certification, including suggestions on how to implement the organic audit trail and how to select a certifier. • Suggestions from farmers and resource suppliers for soil health, organic matter management, and how to use compost and organic fertilizers in a cropping system. • Organic options for pest and weed management from MSU Extension educators and farmers. Save Seeds, Save Genetic Diversity, Save Money: It’s All in What You Plant: Suzanne Ashworth, author of Seed to Seed, will discuss why and how to save a wide variety of vegetable, herb, and flower seeds. Seed to Seed is a complete seed-saving guide that describes specific techniques for saving the seeds of 160 different vegetables and includes information on each including botanical classification, flower structure and means of pollination, required population size, isolation distance, techniques for caging or hand-pollination, and also the proper methods for harvesting, drying, cleaning, and storing the seeds. Suzanne has grown seed crops of every vegetable featured in the book and will demonstrate techniques she has researched and tested. Suzanne Ashworth farms in Sacramento, California, where in addition to producing wholesale seed, she grows gourmet produce for restaurants and a consumer supported agriculture program. A longtime member of Seed Saver’s Exchange, she offers many seed varieties through their annual yearbook. Suzanne will be joined by Michigan farmers John Edgerton and Amy Newday of Harvest of Joy Farm, who will talk about seed saving considerations specific to Michigan’s climate including overwintering biennials and selecting for disease resistance. They will also discuss strategies they have used to integrate seed saving into their CSA production plan and possibilities for community collaborations around seed saving and amateur plant breeding. The event will take place on Thursday, March 10th, at Brody Hall on the MSU campus in East Lansing. The day begins with registration at 8:30 am and sessions end at 5:00 pm. On the evening of the 10th, MOFFA will host a social gathering in the Riverview Room at the Kellogg Center, across the street from Brody Hall, from 5:30 to 8:30. Please plan to stay for the Organic Reporting Session on Friday. The registration fee includes six hours of learning, all-you-care-to-eat lunch at Brody Square, printed materials, and parking at the Kellogg Center (across Harrison Road from Brody Hall). Class size is limited so register today. If you would prefer to pay by check, you can download a registration form, or email us and request that we send you one. A limited number of registration fee scholarships are avail­able; if you are interested please email us at moffaorganic@gmail.com. We've prepared a map showing the locations of Brody Hall, the parking garage, and the Kellogg Center (where you may wish to reserve a hotel room). And finally, please check back over the coming weeks as we add information about this very exciting event!